This is Noah Oakman → sixteen, Bowie believer, concise historian, disillusioned swimmer, son, brother, friend. Then Noah → gets hypnotized. 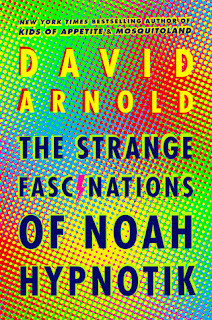 Now Noah → sees changes—inexplicable scars, odd behaviors, rewritten histories—in all those around him. All except his Strange Fascinations . . . I do not know what is worse, the fact that I had waited over seven months to read this book or the fact that I have never listened to a David Bowie song in my life. I feel if David Arnold were to read this past sentence, I would be getting a major judgement stare from his side of the screen. So, let me just preface this review by saying that although I have not listened to a song of Bowie before reading this book, rest assured that a list of songs have now been added to a sheet of papers of which songs I should listen to first. But as for the book now...WOOOW!!! This is my second book of David's I have read and that is because the first one I read three days prior to reading this one. David took me on an emotion packed adventure of friendships, first love, and the idea of remembering past people while this one made me feel like I was flying over a rainbow, riding a unicorn, drinking some type of cherry alcoholic drink. This story felt so out there but felt so right and so needed that in less than a day I was already done reading and didn't quite know how I was feeling. Everyone has strange fascinations, and I mean everyone. For David these fascinations became what I would consider a lifeline. After attending a party, getting hypnotized, and waking up to find out that his friends hobbies, his family pet, and even his parents lives have been altered does Noah look to these fascinations as the things that might be the only thing to reel him back to his reality. I do not know if I read the book with the right idea or not but for me personally I read this as a way for readers to see in a way how high school students are nervous and sometimes scared of the future. Sometimes we want to hide inside this bubble of an imaginary world we create that may not necessarily be a world we enjoy but one where it is more scarier than our own reality so that when we go back, it not as scary as it may seem. There were some moments where I might have teared up a bit and I think that it was mostly because of how wrapped up in the story I became that I wasn't fully ready for the twist or for what happened after the twist. however, for me to feel that lost inside a book is a good thing. Not many authors can fully accomplish that with their writing but David sure did. This was a whirlwind of a story, I am definitely going to be reading more David in the future and as i am finishing this review up I am thinking about how I need to go finally listen to a Bowie song. 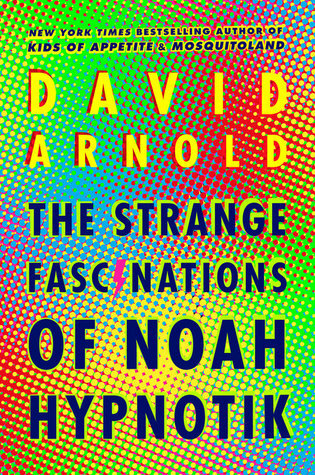 A truly remarkable, hypnotik read, Noah is a must add to your reading list if you haven't already done so.